We stayed at the Hillview B&B for four nights. We had trouble finding it at first, as it is not on Moneymore, but actually right on N18. However, it is very convenient location for exploring the area Cliffs of Moher, the Burren, Galway, and the Connemara. 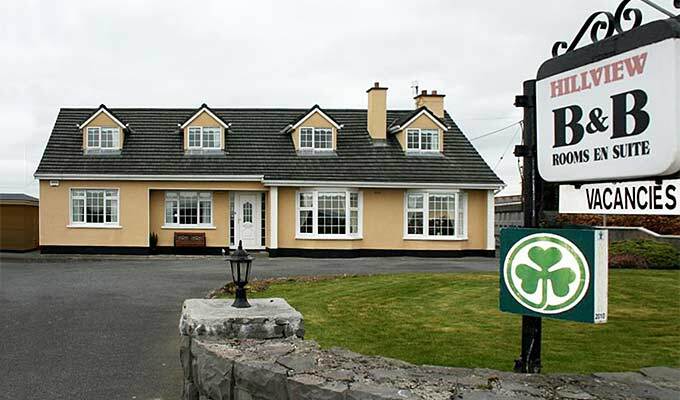 There are grocery stores, restaurants and a laundry located in nearby Oranmore. Maureen is a very pleasant and welcoming hostess. Breakfast was excellent. Room decor was a little tired, but comfortable. Water pressure not great in the shower, but everything was clean and towels changed frequently. Would stay here again and recommend to others. Very comfortable, the lady who hosted us very kind and friendly. Very clean and tidy. A very warm welcome, Maureen is a very friendly hostess. A nice place to stay near Galway for a reasonable price. The owners take great pride in the standards of cleanliness and service at Hillview guest house. When we arrived we were warmly greeted by the owner, who couldn't do enough to make sure we were comfortable. The room was well equipped with tea and coffee making facilities. Good off road parking. The bed was comfortable and the breakfast very good. Excellent value for money. We so enjoyed our short stay with you Maureen! Your warm welcome and friendliness made us feel at home immediately. The room was so comfortable and your breakfast amazing. We would definitely recommend your accommodation to anyone traveling in your area. Very warm welcom, good room quality, very good breakfast. Thank Young! Vielen Dank für die überaus herzliche Aufnahme, die sehr reichliche leckere Bewirtung und die schöne Unterkunft. Wir waren sehr gerne bei Maureen und Gabriel. Alle Wünsche wurden uns erfüllt. Wir kommen gerne wieder. Maureen was very, very kind and chatty/fun to talk to. She gave us terrific directions on sightseeing and even helped us re-structure our trip a bit so that we could maximize our time. The location of the B&B was a bit inconvenient based on the sights we were trying to see; there was a fair amount of driving no matter where we went. If we could transplant this B&B closer to Connemara National Park a favorite stop of ours, we would definitely stay there again. My two adult daughters, wife, and I were traveling from Dublin to Galway for the Arts Festival in late July 2012. We were concerned about the congestion there might have been in Galway and decided to stay at Hillview, just outside of Oranmore. The convenience factor cannot be overstated. We took a city bus into Galway for the Arts Festival 20 minute ride for Saturday , drove to Kinvarra and the Dunguaire Castle on Saturday evening, and then drove to Coole Parke on Sunday morning. The driving including how to handle the "roundabouts" was made that much simpler with the provision of practical comments and advice of the Hillview proprietor, Maureen Murphy. Mrs. Murphy had greeted us at the door of Hillview when we arrived on a Friday evening and was the perfect hostess throughout our two night stay. Of course, the Irish breakfast served by Mrs. Murphy was wonderful and kept you "filled up" until supper. There is no question that Mrs. Murphy and Hillview will see my family again in the future. I needed somewhere to stay in a hurry in the Oranmore area. Mrs Murphy the proprietor was a delight to talk to on the 'phone and gave me good directions on how to find the place. The welcome was good. The place is spotless. The breakfast was great - more than I'd normally eat in 3 breakfasts and cooked with care. From the dining room one looks out towards Galway Bay and the mountains of north Clare. Oranmore town village is a 5-minute drive and seems well endowed with restaurants. The airport is 10 mins. I didn't drive into Galway city but I'd guess about a 20 minute drive. Would I stay there again Definitely!